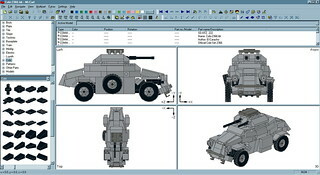 Wouldn't it be great to be able to build with "virtual" Cobi parts to first design your Cobi MOCs digitally (to estimate which parts it will require) and share building instructions for your Cobi MOCs afterwards? I searched the Internet for a Cobi parts library for LDraw, but sadly could not find anything, so it seems such a parts library does not exist ... yet! Apparently if I wanted such a parts library, I would have to create one myself. So I thought to myself ... "How hard can it be" ... well ... it turns out to be very hard and probably impossible to achieve by a single person (who also has other things to do ... e.g. his job). A 1x5 and 1x7 plate, where you just have to shorten an existing Lego plate part by 1 stud. Or various tiles (2x6, 2x8, ...), where you just have to delete the studs from existing Lego plate parts. Learning the LDraw format by modifying these simple parts lead me on to try some of the more complex parts. 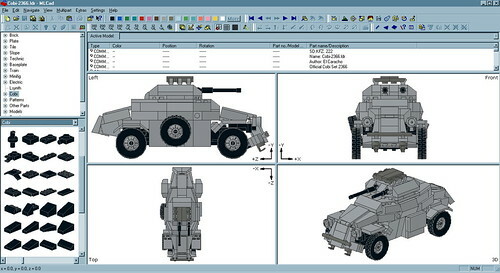 One of the essential things that make Cobi models clearly distinguishable from Lego models is the fact that Cobi has a lot more parts without studs, namely the studless slope parts which can be combined to a continous long studless slope without any breaks. Also various wing shaped tiles without studs are unique to Cobi and give Cobi models their distinctive studless look. So the goal should be to create these basic assortment of slope and tile parts first, and handle the special parts like gears, wheels, tyres, etc later. So far I managed to create almost 200 custom Cobi parts, some "quick & dirty" which may need additional work, but also some pretty sophisticated creations that I am quite proud of. Unlike Lego bricks, I could not find a unique parts number on the Cobi bricks. So the question is, do such Cobi part numbers exist, or do we have to come up with our own parts designation? In order to be successful, this task should be handled in an organized way, and the fist step is probably to name all the custom Cobi parts. Then a list of who is willing to do which part would be useful, to prevent people from working on the same part simultaneously.